Wicker balls and rings make great toys for rabbits and keep their teeth in good shape. Make sure you provide plenty of fibre in your bunny's diet. Always have hay available and keep pellets or mix to a minimum. Rabbits love fresh greens too! Does your cage have a front door like this. Do not let your bunny use this front "door". Many a bunny has seriously injured its leg in the bars. 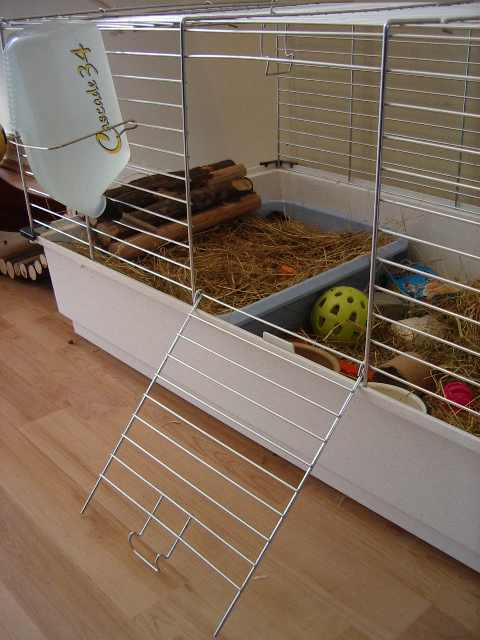 If you have to use this door, cover the bars with wood or Instead buy a side opening cage and make a ramp if necessary.